While some folks can’t make sense of a move up or down, there are others who have specific wants/needs, and are willing to forge ahead – if they can just sell their existing home and pour their equity into the next one. I’m three for three this year with contingent sales already, and I wouldn’t be surprised if half of my sales in 2019 will involve contingent buyers. The challenge gets more complex when multiple sales are contingent! 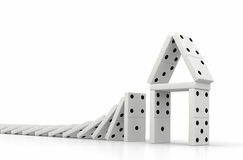 They stack up like dominoes, all dependent on sales on either side to be completed successfully – and risk all crashing if a problem pops up that can’t be solved. Up to now, listing agents and sellers haven’t had to deal with contingent buyers because we’ve had enough non-contingent buyers to go around. Not any more. The #1 reason sellers and listing agents should consider a contingent offer? They know they are asking a favor, and in effect, they are purchasing a favor. Plus, their purchase is contingent upon them selling their house (read: getting the price they want), so everybody gets what they want. Win-win! Contingent sales can be highly speculative, however, and our existing system doesn’t provide a safety net, so there is a risk that every seller could get left holding the bag. How can we tighten these up? Have buyers obtain full loan approval. At least if the buyers are fully approved by the mortgage underwriter, that concern is satisfied. A pre-qual letter isn’t solid enough to tie up a property. Review the lender downstream. If there is a chain of contingent sales domino-ed together, let’s take a good look at everyone’s lender letter – because we’re all in it together. Review the agents downstream. Is everyone competent? If my sale is reliant upon an agent downstream finding and solving problems, then it’s not asking too much to know who it is. What else have they sold lately? Supply comps and photos of contingent properties. Every agent involved should know – and get to render their opinion – on the price/value of the other homes in line. Bridge loans. Bridge loans are out there, and Compass should have a good alternative ready before too long. A fantastic option that solves everything. There is another viable alternative that every contingent-buyer should consider: Selling your home first. The immediate reaction is usually the same – I don’t want to be left homeless, or I don’t want to have to move twice, which is understandable. Our ability to master the contingent sale will probably make or break the market this year. Without them, will there be enough buyers with the equity, desire, and ability to keep the party going? It’s doubtful. Most realtors, let alone buyers and sellers, are unfamiliar with contingent sales. But this is where our creativity will pay off in a challenging market! As an appraiser… buyers and sellers should be prepared that the buyer’s “gift” to the seller for accepting their contingent offer may or may not be supported by the comparable sales. Quite often when I analyze a contract for sale that right off the bat catches my attention as possibly exceeding what is supported by the market… it is a contingent sale. And, in this market where there has been spotty price softening, that could be a recipe for the seller to be hit with a double whammy; buyer’s inability to perform followed by the seller’s home being placed back on the market a month later. Thanks Tiemo……for making the case why sellers should list their home with a top-notch professional realtor! I prefer to think of those of us with the means to make no contingency offers as paying less rather than contigency offers paying more. Tiemo makes the other case quite well. Either way it’s just research whether buyer or seller to see what the other side values. My favorite when buying is to point out a quicker closing means one or more fewer mortgage payments.